Francis Tysoe Smith (1853-1927) was a fine maritime painter. 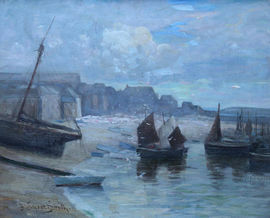 She was one of the principal women artists active in St Ives between 1907 and 1927. She is listed as a painter of flowers and landscapes who lived in Wales and Cornwall and showed at the RBSA, Walker Art Gallery, Liverpool, London Salon and Royal Academy. In 1914 this artist member of the Arts Club signed in the painter Thomas Liddell as a visitor. The following year she exhibited at the Show Day. 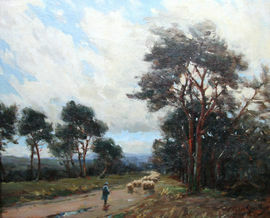 At the 1923 St Ives Show Day and in 1924 she exhibited from her own studio, showing a large landscape, 'marsh lands with water in the foreground, and a flock of sheep beyond', alongside two other paintings. She shared the Blue Studio with her sister.